Journal Club 10-29-16 | Passive Income M.D. Every week, I hold a JOURNAL CLUB. After manually filtering through the millions of articles out there, I present a few that I think are extremely impactful. This will help lay the foundation for some of the topics that we’ll dig into on this website. Again please note that there a new Sponsor Q&A section at the end where I get a little personal and try to get to know them a little bit better. 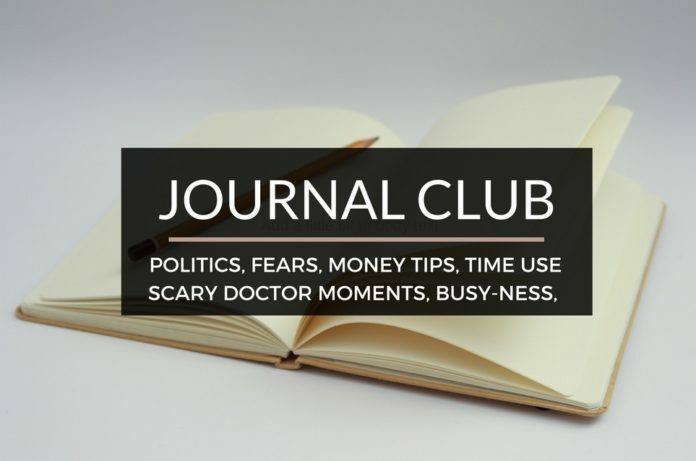 Here’s our Journal Club for the week, enjoy!. I’m extremely grateful for the comfortable life I had growing up. To hear some of the struggles FutureProofMD has gone through makes me appreciate it even more. See where his drive comes from and also his greatest financial fear in Financial Fears. Thankfully I’ve never made any financial mistakes in my life. Okay, that’s a fat lie. You don’t know how many times I’ve wished I could go back and slap some financial sense into the younger me. Dr. Wise Money pens a nice letter to her younger self that hopefully we can all learn from in 6 Money Tips I Would Tell Dear Younger Me. “It’s easy until it isn’t” is kind of how I describe my job. Physician on FIRE is a fellow anesthesiologist and his post had me seeing flashbacks to some of the scarier moments in my career. Check out his Halloween themed post Boo! Being a Physician Can Be Downright Scary. Raise your hand if you feel like you have all the time in the world. I don’t think there’s a person I know who doesn’t feel like they’re extremely busy. If you’re a parent, that’s an automatic certainty. Mrs. PIE of the blog Plan.Invest.Escape takes on this topic of busy-ness – what that actually means, how we create that state, and how to handle it in Not Now, I’m Busy. Running with the topic of “busy-ness,” how do you decide what’s worth your time and what isn’t? Tim Urban, of Wait But Why, says an easy way to visualize your time is to break it into 100 10-minute blocks (that’s about the amount of awake time you have each day.) How do you use up those 100 blocks each day? This short post, 100 Blocks a Day had me thinking for a while. I was really never that big into Halloween prior to having kids. If I had to dress up to go to a party I’d put together a costume that took the least amount of effort and you can forget about me trying to be clever. However, now that I have children, I look forward to this holiday so much, mostly because kids look so freakin cute in costumes. See exhibit A.
Anyways, I was able to attend my child’s halloween parade at school today and even though not much happened, it did make me think, I never want to miss these moments. It’s moments like this that keep me motivated to continually push for financial independence. Thanks for your continued support of the site. Have a great Halloween! You mention on your site that your husband is a physician. What medicine does he practice? He’s a Palliative Care physician. F.I.T. actually stands for Financial, Investment and Tax planning but I do believe in an active lifestyle. Since I live in a beach town, I love to run and bike along the water. In the evenings, my husband and I take our 5-month old daughter for walks in the neighborhood. We used to live in Chicago and it was tough being confined indoors 6-8 months out of the year so we are really enjoying the nice weather all year round. Anjali Jariwala is a CPA and CFP® with a decade of success in tax consulting and financial planning. She founded FIT Advisors to combine these two skill sets and elucidate tax implications during financial planning. Frustrated by the way many financial planners push products with hidden fees and commissions, Anjali decided to exclusively use evidence-based investment strategies and a transparent fee-only structure to eliminate any conflicts of interests. Anjali takes a holistic approach as a financial life planner, helping clients discover their goals and build a secure future.